As the trend of the world shifting to academics in recent years, source of education knowledge is not limited to classrooms or books anymore. With the arrival of digital education, Infortrend storage systems can become your most powerful backing when pursuing a digitalized process with emphasis on efficiency and amount of knowledge. 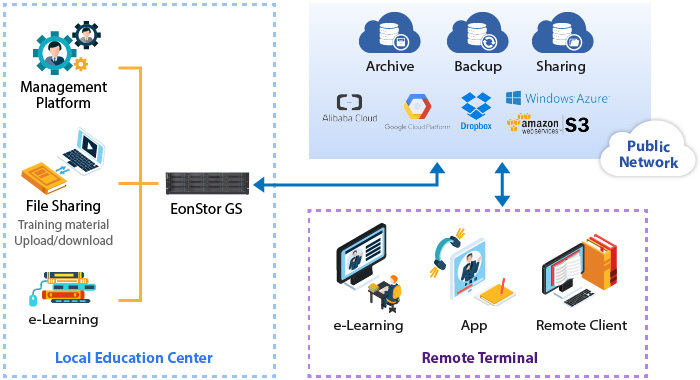 EonStor GS/GSe Pro unified storage systems feature high performance, rich data services, and cloud integration to ensure data integrity and security. With Infortrend’s SyncCloud feature, various cloud services can be integrated with numerous cloud providers, storing frequently accessed data from the cloud to local storage as cache to speed up data access. Data stored on the cloud can be backed up to different sites to realize efficient disaster recovery. EonStor GS/GSe Pro supports a wide range of file systems and interface protocols to offer users flexible deployment and convenient file sharing during scientific research.